Goldthwait is no stranger to entertainment and is one of the most recognizable comedians in show business today. Bobcat has been on the creative fast track driven by his passion to make movies. Bobcat’s sixth movie entitled “Willow Creek,” a movie about Big Foot, is now showing in theaters nationwide and available on DVD. The film is a found footage horror film about a young couple who hike into the remote woods in search of the famous Patterson/Gimlin Bigfoot footage sight. It was shot on location in and around Willow Creek, and features a mix of actors (like Alexie Gilmore and Bryce Johnson who co-star,) and local townspeople in real interviews done for the film. “Willow Creek.” Bobcat’s newest film “Call Me Lucky,” is a documentary about political satirist comedian Barry Crimmins that is already creating a buzz with the media. For more details on that film check out bostonglobe.com. Goldthwait’s inimitable talent for writing and directing was clearly displayed in his previous movie “God Bless America.” His often off the beaten path style of creating flicks allows audiences to experience films that other artists may have never dared to attempt. “God Bless America” is a black comedy that stars Joel Murray and Tara Lynne Barr in a modern day Bonnie & Clyde. In the words of the director himself, “It’s a violent film about kindness.” Bobcat’s imaginative eye behind the camera caught the attention of Esquire Magazine where they named Goldthwait “Director of the Year.” Goldthwait unleashed his one of a kind brand of comedy in his newest Showtime one hour special entitled “You Don’t Look the Same Either.” The stand-up special features riffs on politics, divorce, going broke, and his career as a director of film and TV. The genre-defying Police Academy alum returned with a self-deprecating and topical instant comedy classic, taking the audience on a hilarious journey through his 30 year career as an eighties icon, to the guy who lit the Tonight Show set on fire…literally! Bobcat’s new special/DVD “You Don’t Look the Same Either” is available nationwide. For the Amazon link go to: http://goo.gl/v4DC8z He has come a long way since his first film “Shakes the Clown” back in 1991. 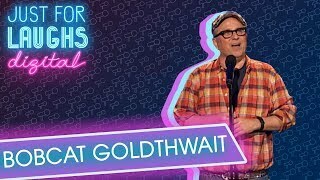 Since then Goldthwait has gone to make many more movies including “Windy City Heat,” “Sleeping Dogs Lie,” and “World’s Greatest Dad” that stared Robin Williams. There’s no doubt, there will be many more movies to come.Since his first appearance on David Letterman at the age of 20, Bobcat has expanded his resume, directing movies and sharing his behind the camera talents on shows such as; “Jimmy Kimmel Live,” “The Demetri Martin show,” “The Chappelle Show,” “The Man Show,” “Maron,” and “Crank Yankers.” Best known for his unforgettable movies that were huge in the 80''s, Bobcat has also starred in several HBO specials and a slew of television appearances too numerous to mention. Bob continues to push the envelope with his unique brand of humor headlining major comedy clubs across the country.